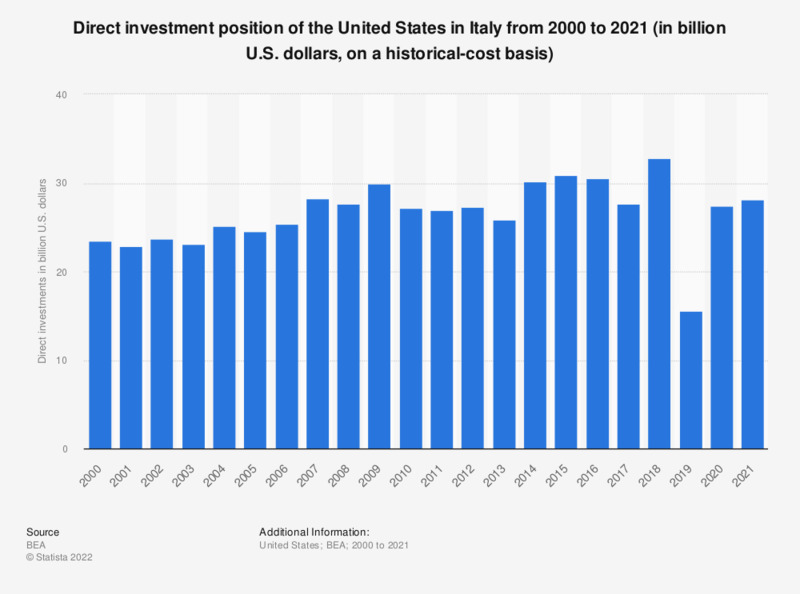 This statistic shows the direct investment position of the United States in Italy from 2000 to 2017, on a historical-cost basis. In 2017, the U.S. investments made in Italy were valued at approximately 30.71 billion U.S. dollars. The total direct position of the United States abroad amounted to 6.01 trillion U.S. dollars in 2017. In accounting, historical cost is the original monetary value of an economic item. Historical cost is based on the stable measuring unit assumption. In some circumstances, assets and liabilities may be shown at their historical cost, as if there had been no change in value since the date of acquisition. U.S. direct investment abroad is defined as ownership by a U.S. investor of at least 10 percent of a foreign business. The direct investor is known as a U.S. parent, and the U.S.-owned foreign business is known as a foreign affiliate. International transactions statistics cover the foreign affiliates’ transactions with their U.S. parents, so these statistics focus on the U.S. parent’s share, or interest, in its affiliates rather than on the affiliates’ overall size or level of operations. The major items include capital flows, which measure the funds that U.S. parents provide to their foreign affiliates, and income, which measures the return on those funds. Direct investment position statistics are stocks and are cumulative; they measure the total outstanding level of U.S. direct investment abroad at year end.